Welcome Becky from the Denver Craft Ninjas as our first Guest Blogger! If you don’t know about the Denver Craft Ninjas, then you should! Read on to see how you can make super cool DIY Halloween Headbands from our local craft guru……..
Don’t have time for a complete costume this year? Or can’t figure out what will pull together your delightfully frightening costume ideas? Get together with your friends, like I did, and DIY the cutest little Halloween headbands! 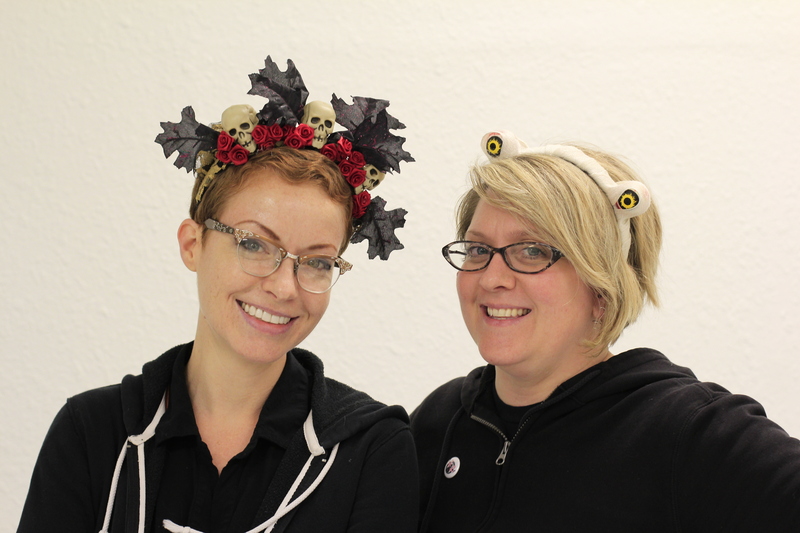 Amber and Becky (Denver Craft Ninjas) model their spooky headband creations! Headbands are the perfect blank canvas for your costume idea. Add some plastic bones and roses, a little greenery and a red eyed raven, or tulle and spiders to create spirited accents that work perfectly on their own or as an addition to a complete costume. She’s Crafty! Awesome Denver Craft Ninjas Halloween craft studio. My lovely assistant Amber and I played with a variety of materials to create three great headbands that will work for any age. And really the materials are the best part, right? We gathered fabric flowers, scrap fabric, and a few cheap Halloween necessities and set to work. Many of these items can be found at arc Thrift Stores! First, is our adorable Mummy Eyes headband! Amber whipped this super cute, asymmetrical eyed accessory up in no time. To start, grab a fairly wide headband and wrap with a gauzy fabric or ribbon and secure with a glue gun. 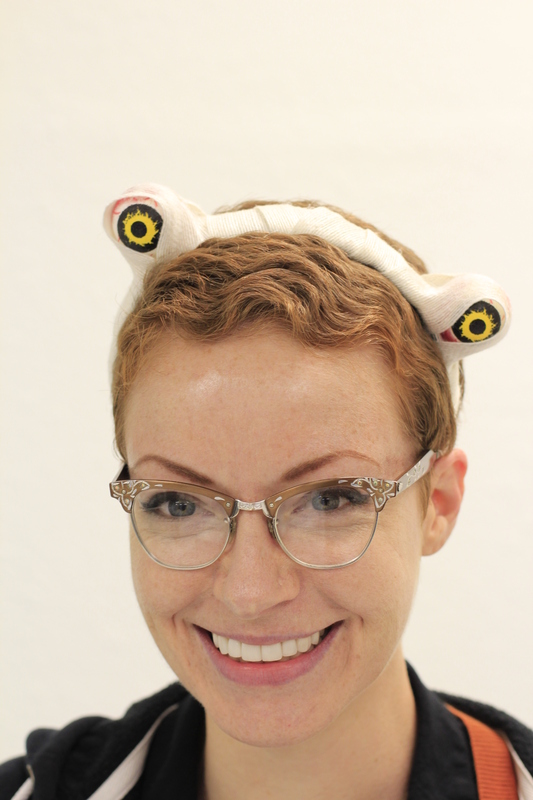 Then grab some creepy, bloodshot eyeballs (we used a pre-painted foam eyeball) and glue them wherever you want on the headband. Amber decided on a crooked placement for the eyes and it minimized the ghoulish and made it a little silly. And last, Amber wrapped a little ribbon around the eyeballs. A totally cute addition to a mummy costume or just something fun to wear all by itself! 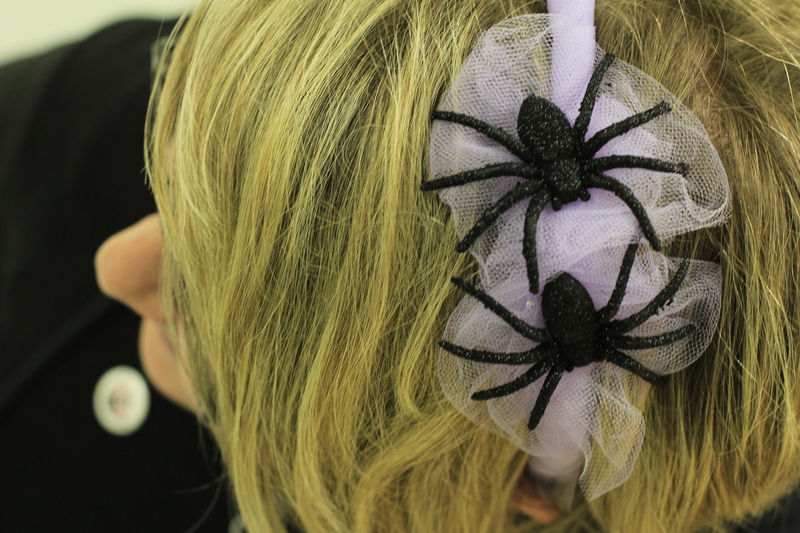 Second, is our simple spider headband! With this project, we used some lavender tulle and wrapped it tightly around a thin metal headband securing it with a glue gun. We made charming tulle rosettes by gathering small pieces of tulle and then placing a dot of hot glue in the center to hold the rosette together. Be careful! 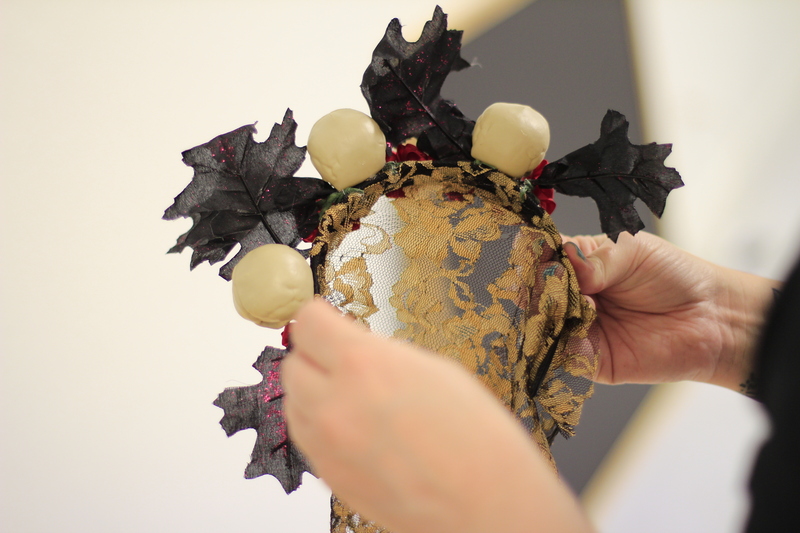 The hot glue will seep through the tulle and can burn your fingers. The tulle will naturally fan out and make whispy bases for sinister, sparkly spiders to sit on. Another small dot of glue in the center of the rosette will secure your spider to the rosette. Then decide on placement for your spider! We placed two spiders right next to each other for extra creep factor! This is a great project to experiment with! The tulle is so fun to play with and it’s fairly easy to create a haunting veil that hangs over your face. Our last headband turned out to be our favorite! Inspired by Dia de los Muertos, we created a spooky statement piece that can be worn with a whole costume or on it’s own with some really gorgeous face paint! In our hunt for pieces to use for these headbands, we were drawn to these lovely black leaves with purple glitter on them. PURPLE GLITTER! We took apart the leaves and placed 6 leaves, 2 at a time, in the middle and on the sides of the headband with hot glue. Then between the leaves we placed fun mini skulls which created a kind of crown. Finally, between skull and leaf we tucked little trios of mini fabric red roses. After letting the glue set on all the pieces, it’s a good idea to adjust the leaves to be sure they don’t obscure any of the other elements of the headband. Voila! You have three great looks to jump start your costume plans! 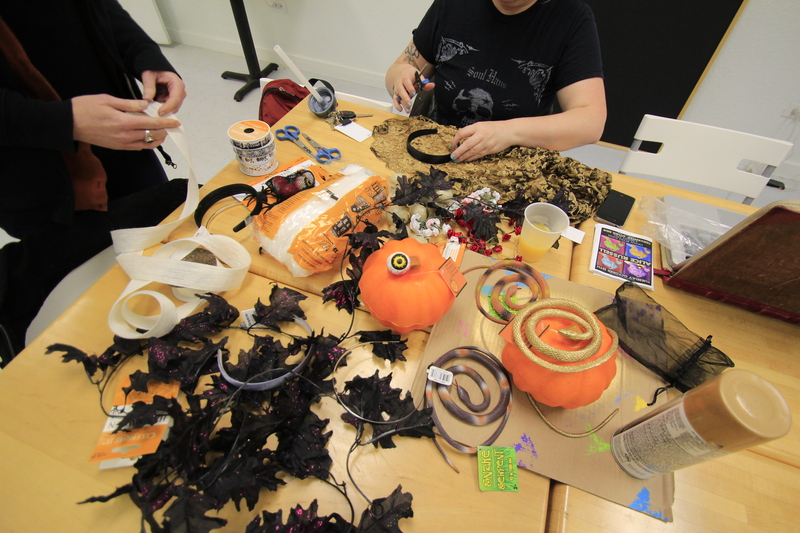 Halloween is a great time to get your glue gun fired up and create something handmade that is as individual as you are! Visit the Denver Craft Ninjas new craft space called Share.Denver located at 28th and Fairfax in Park Hill. Zombie lovers unite this weekend at the 8th Annual Denver Zombie Crawl! It’s the largest zombie crawl in the world, right here in Denver, and we can’t wait to be a part of the walking dead that will take over the 16th Street Mall beginning at 2:00 PM this Saturday, October 19th. 1. Choose your Zombie Type: Zombie Soccer Mom, princess, business man, ballerina, football player etc. are easy starter ideas. 2. Select your costume base: Tutus, prom dresses, business suits and athletic gear are good clothing choices but make it CHEAP because you are going to destroy the garments. 3. Zombify your costume: Grab a pair of scissors, razor blade or box cutter and get to work ripping and shredding! Then add some fake blood (You can buy it or experiment with making your own with some corn syrup and food coloring), and rub in some dirt for a complete zombie ensemble. 4. Hair & Makeup: go simple with some Halloween grease paint makeup kits for a gory look then top it off with messy, dirty hair or an old wig that you don’t mind destroying. Consider arc Thrift Stores your Zombie headquarters – we are here to help you Zombify! We have an unbelievable amount of Halloween costumes at all 22 arc Thrift Store Locations. Princess, Witch, Zombie, Super Hero…you name it, we’ve got it! Peace. Love. Happiness. Let your inner hippie fly free this Halloween with a groovy costume that doesn’t cost much to make AND it makes you happy! Halloween Happiness – Our New Blog! Welcome to our new blog! Join us all month long for a series of DIY tips and tricks to make this the scariest (and thriftiest) Halloween ever! We’ll share fun costume, craft and decor ideas that won’t break the bank.